We feature the ever-popular and thoroughly entertaining CAKEWALKIN’ JASS BAND, especially including, of course, leader and clarinetist RAY HEITGER, further populated by such northwestern Ohio notables as Prof. DAVE KOSMYNA on cornet; pianist and band leader in his own right RICK GRAFING, and wife BANJO BETSY (on banjo, naturally); trombonist RUSS DAMSCHRODER; drummer BUDDY LOPEZ, and adding her own special talents to the band’s appeal, is vocalist NICOLE HEITGER. This is an historically significant band, having become very popular during its 34 years’ stand at Tony Packo’s in the Toledo area, as well as a variety of appearances nationwide. See them and learn more at www.rayheitger.com. 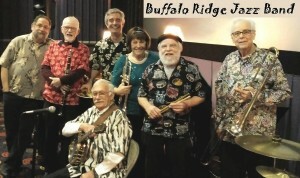 And, having earned the title “A Cincinnati Jazz Treasure Since 1996,” the revitalized BUFFALO RIDGE JAZZ BAND will make its appearance under the leadership of superb trumpeter SALLY LUKASIK; with husband and clarinetist JOE LUKASIK; trombonist BOB BUTTERS; master tubaist and world navigator MIKE WARD; drummer extrordinaire GUS ROSS; the band’s founder and banjoist BOB ADAMS; and a new addition, CCM Prof. PHIL DeGREG, on piano. Despite a recent hiatus, primarily due to health problems, the BRJB has now emerged even stronger than before, adding the above new member to its roster, new tunes to its book, and resuming a busy schedule of appearances See their impressive new website: www.buffaloridgejazz.com.